Happy Cinco de Mayo! We hope you’re celebrating with some fabulous Mexican cuisine today. We’re feeling especially festive because we’re introducing our first cookbook review, too! We look forward to sharing reviews and recipes from the latest cookbooks, both here and on our website. We’ll start off with Truly Mexican, by Roberto Santibañez, chef and owner of NYC’s Park Slope restaurant Fonda, which has become a popular dining destination for authentic Mexican cuisine. Remember what Julia Child’s cookbook did for French cuisine? 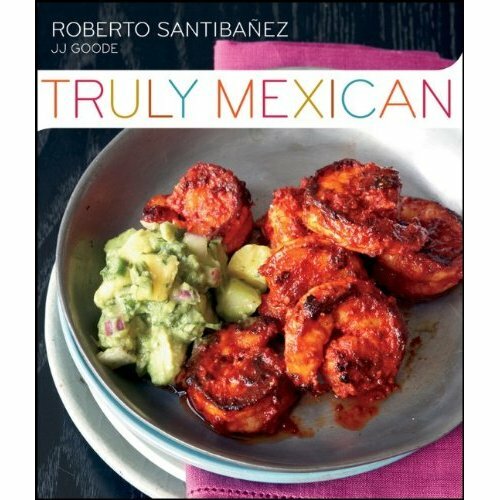 Well, Roberto Santibañez similarly — and successfully — offers us the art of preparing a foreign cuisine in his new book, Truly Mexican. While walking us through the process of composing authentic Mexican sauces and condiments, we learn techniques that are important to Mexican cooking, such as toasting chili peppers and roasting tomatoes. We learn about Mexican staples, including spices, nuts and seeds, and fruits and vegetables. Because the focus of the book is on sauces and condiments, entire chapters are devoted to salsas, guacamoles, adobos, and moles and pipianes. “I chose those sauces and dishes that contain accessible ingredients, illustrate important culinary concepts, and of course, taste amazing,” explains Santibañez. That’s not to say you can’t craft an entire Mexican meal from these recipes. In fact, we learn how to use the sauces and condiments to transform a piece of meat or poultry into an irresistible, authentic ethnic dish. (There’s even a chapter on “More Ideas for Using Mexican Sauces.”) A chapter on “Sides for Rounding Out Your Meal” includes such basics as Mexican Fried Rice and such delicacies as Chipotle-Avocado Leaf Black Beans. And there’s no shortage of inspiring photos. Don’t buy this book if you’re looking for something to whip up in a flash for dinner tonight. But if you love Mexican food and want to expand your repertoire beyond the usual taco Tuesday fare, invest in this cookbook. What you’ll get in return is a thoughtful, inspiring course in authentic Mexican cooking. For a sampling of the recipes in Truly Mexican, check out these three from the book on our website: Peanut and Arbol Chile Salsa, Lamb in Modern Yellow Mole, and Mexican Red Rice. For more about Mexican cooking — and additional recipes — check out Cooking Great Mexican. Watch the beautiful preview of the book, and see if you don’t feel like celebrating Cinco de Mayo right now. This entry was posted in In the kitchen, Natural health and tagged chef, Cinco de Mayo, cookbook, cooking, food, global, Karen Miles, Mexican cuisine, nutrition, recipes, Roberto Santibañez, spices, Truly Mexican cookbook by Cayenne Room. Bookmark the permalink. Yummy. I’ve always wanted to learn how to make mole sauce.